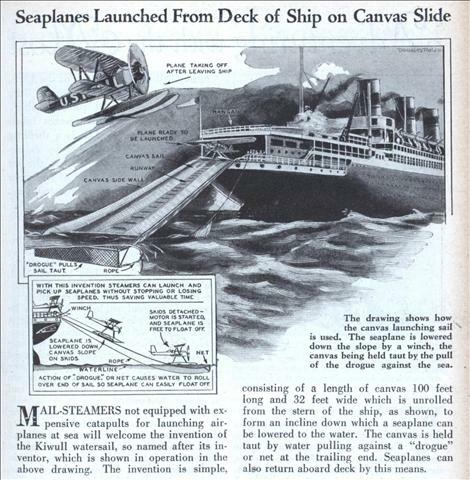 MAIL-STEAMERS not equipped with expensive catapults for launching airplanes at sea will welcome the invention of the Kiwull watersail, so named after its inventor, which is shown in operation in the above drawing. The invention is simple, consisting of a length of canvas 100 feet long and 32 feet wide which is unrolled from the stern of the ship, as shown, to form an incline down which a seaplane can be lowered to the water. The canvas is held taut by water pulling against a “drogue” or net at the trailing end. Seaplanes can also return aboard deck by this means. 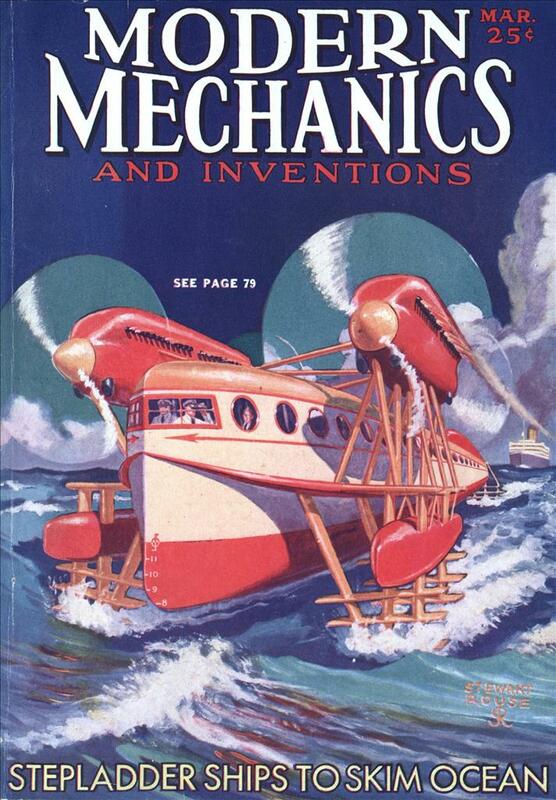 By 1930, the airship Los Angeles had aircraft that could “land” via a hook and eye system. Why didn’t they just adapt that structure to a seaplane and use one of the boat davits to drop and pick up the plane? Toronto: the Los Angeles just tested the prototype aircraft trapeze system and then it was removed. The airships Akron and Macon actually used an operational system. FB: Yeah, but didn’t the Ak and Mac not fly until 1932-33? The LA fit the time of the silly “Slip ‘n’ Slide” proposal from the article. Toronto: Maybe “they” didn’t think about it because that system was for something in flight, and not something on the water? In other words, either it wasn’t in their minds because it was a different system used in a different field, or maybe they -did- know about it, and the whole “not-invented-here” hubris/arrogance took over? The fact that cultures and attitudes within some fields of inquiry/knowledge sometimes prevents (and may even actively discourage) the cross-pollination of ideas and knowledge that might directly help to advance both. What advances for “tomorrow” are being inadvertently held back because of this issue? Good point, Andrew. But they’ve been hauling lifeboats and lighters and launches out of the water with davits for a long time. I would have thought they’ve have called up a couple of aircraft companies and ask “Do you have a small plane we can haul vertically out of the water with a winch?” and have been directed to the Curtis Sparrowhawk. But I do give them points for the canvas slide. We wouldn’t be talking about them 80 years later if they’d taken the non-weird way out.